More than just a place to stand while you’re showering, your shower floor influences the overall look and feel of your bathroom. The material you choose should not only be durable, comfortable, and slip resistant, it should also suit the aesthetic of your bathroom decor. 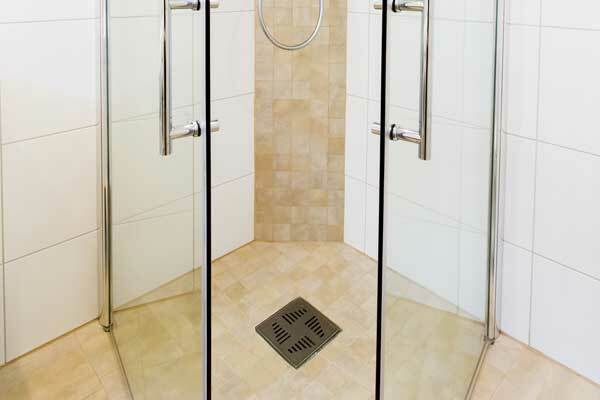 No matter what your needs and preferences, there’s a shower floor that fits. One of the simplest and most affordable shower floor options is a pre-fabricated shower base made of synthetic material. These consist of one solid piece that’s set into place as-is. There are no grout joints that could crack and leak, so they’re easy to maintain. On the downside, they’re manufactured in a limited range of standard shapes and sizes. That means they can only be used in showers built to common standards and you can’t move the drain if you don’t like where it is. Cracks and chips can be repaired by a specialist, but if this type of floor develops a leak, it can’t be repaired like a tile floor and will have to be replaced. Fiberglass bases are usually the cheapest, so they’re a common sight in bathrooms around the country. They’re not particularly durable and tend to yellow or crack. Acrylic shower floors don’t look much different from fiberglass models when new. The difference is that acrylic models are protected by an acrylic coating, which makes the floor easier to clean and helps it resist yellowing, cracking, and mildew growth. These floors retain heat better than fiberglass and stay warm to the touch, so you won’t have to step onto a cold shower floor in the morning. Like fiberglass, they’re relatively light, which makes them easy to install. Available in a wide variety of colors, shapes, sizes, and finishes, stone and tile let you give your creativity free rein. If you prefer a consistent look instead, use the same material for your shower floor as you did for the rest of your bathroom floor. 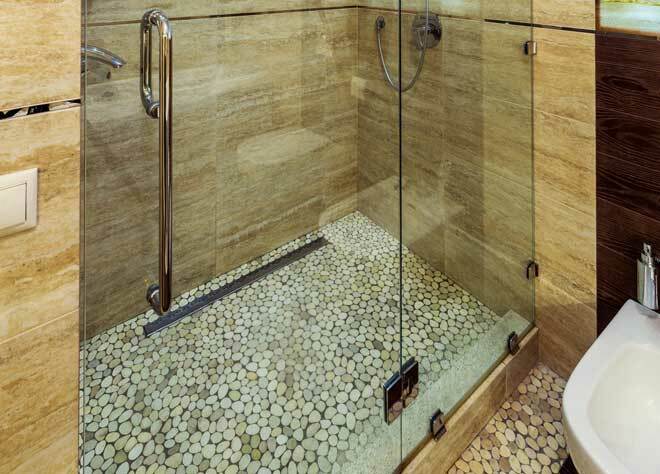 After fiberglass and acrylic, stone resin is the most popular material for shower flooring. Stone resin shower bases are made from a mixture of crushed natural stone and a resin-based adhesive. This mixture is molded, then coated with acrylic or finished with marble, granite or another stone. Like acrylic, stone resin floors are warm to the touch. While these floors are more durable than acrylic models, they’re also heavier and therefore somewhat more difficult to install. If you prefer the look of tile, ceramic and porcelain are your two main options. Ceramic costs less and is lighter than porcelain. Porcelain, a type of ceramic, is more durable and dries faster. The only problem is that it doesn’t retain heat well, making it chilly underfoot. Large tiles require fewer grout joints, which makes it easier to keep the shower clean. Mosaic tiles are a little harder to maintain thanks to the many joints between these tiny tiles, but they give you much greater flexibility in terms of color and design. They’re also easier to install along the slope of the shower pan. If you settle on tile, you have two options for installation. One is the old-fashion mud bed installation. This involves building a shower pan base by applying mortar with a trowel and then laying the tiles in the mortar. This kind of handcrafted shower floor adds a touch of individuality your bathroom. Alternatively, save time by installing a one-piece shower base that’s pre-sloped, waterproofed, and ready for tile. Natural stone always adds a sense of luxury and, like tile, it lets you create a unique look. Almost any natural stone can be used for a shower floor as long as the stone is properly sealed. Good choices include marble, granite, onyx, travertine, and sandstone. Large, flat stones aren’t your only option. Pebbles, including river stones and glass pebbles, bring a dash of color and variety to your shower. Just be aware that pebble floors involve a lot of grout and, if the surface is uneven, they can be somewhat uncomfortable to stand on. A long-time favorite, a cast iron shower floor will lend your bathroom a vintage look, so it’s perfectly suited to rustic or country farmhouse decor. Cast iron costs less than tile and it’s so durable you’ll probably decide to remodel your bathroom before the shower floor wears out. While it’s easy to maintain, care is needed because the porcelain enamel surface can become scratched or worn if you clean too aggressively. If the surface is damaged, the cast iron underneath can begin to rust. The main drawback of these floors is that they’re cold, which can be a bit of a shock when you first step in. It’s probably not the first material you’d consider for a shower floor, but wood slats in the shower can subtly upgrade the look of your whole bathroom. Depending on the design and wood you use, a wood floor can create the ambiance of a high-end spa or the coziness of a rustic cabin. In these designs, wood slats sit atop a standard shower floor, allowing water to trickle down through the slats into the shower pan. This way, you won’t even see the drain. There’s less splashing, so you can forego the shower door to save space or give your bathroom a more open and airy feel. While wood slats aren’t as durable as other shower floor surfaces, they’re easy to repair. The woods best suited to use in the shower are those from moist, tropical climates. On the pricier end you can choose from teak, ipe, and massaranduba, but cedar, redwood, mahogany are good budget-friendly options. 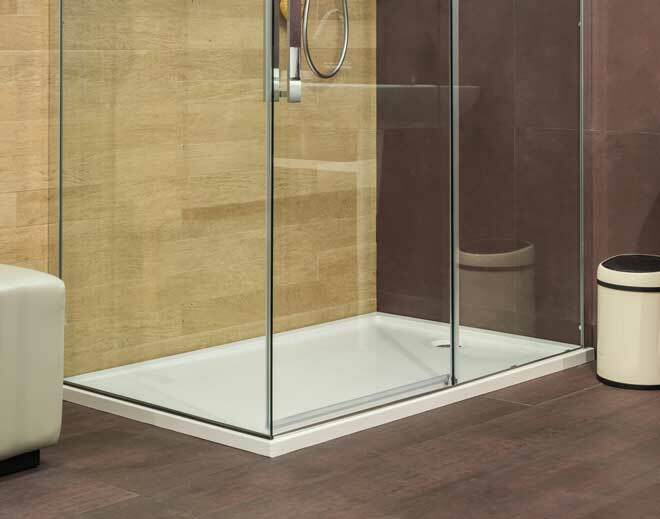 With so many shower floor options available, it can take some time to narrow your choices down to the one that best meets your requirements in terms of durability, maintenance level, and aesthetics. Instead of heading right to a warehouse store, stop into a few specialty stores first. The sales staff in these stores are well informed on the subtle differences between different flooring materials and can help you make an educated choice.